I was listening to Democracy Now! earlier this week as they looked back at all of the uprisings around the world during 2011. From Tunisia, Egypt and Libya to Spain, England, Syria, Bahrain, Chile and more, including the US. Time Magazine called them Protesters – and recognized them as the People of the Year. But protester isn’t the right word. Revolutionaries might be better. It was a fascinating reminder of how many protests there were around the world last year. And also a reminder of the way the power elites used their police and armies to crack down on these uprisings. I remember watching the footage of the violence in Oakland the night Iraq War vet Scott Olsen was injured by a tear gas canister shot at him from close range. The scene looked like it was from a war movie or the scenes from Egypt and Libya when the authorities retaliated against the people. Only time will tell if the Occupy Wall Street Movement will have the same level of impact as the uprisings in the Middle East. However, it was obvious to me that even these small encampments got under the skin of the people in power enough to mobilize the Federal, State and Local government to remove them, by any means necessary. The first uprising in the US last year, happened in Wisconsin. 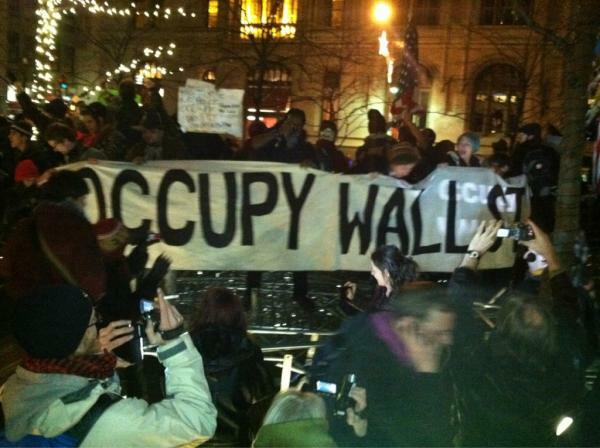 The uprising there laid the groundwork for the OWS Movement. In the past I highlighted my friend Sam Mayfield who is working on a documentary about the uprising in Wisconsin. She now has posted the trailer for the film – currently titled Wisconsin Rising – on a Kickstarter page where she is looking for donations to allow her to finish the film. Please view the trailer and consider helping make this film a reality.